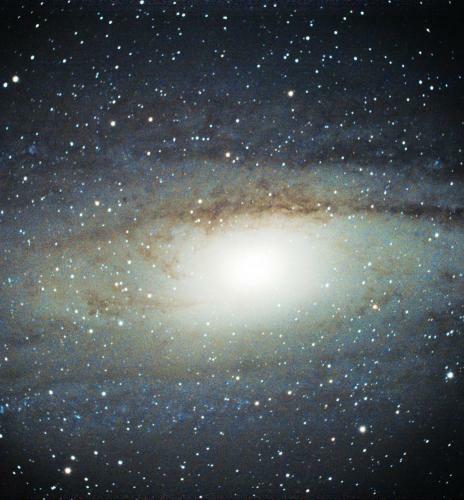 Here's the heart of the Andromeda Galaxy through the 8" LX90. Used the Canon T5 and Meade focal reducer. 14 subs at ISO 6400/70 second exposures stacked. Nice image. That big dust lane really stands out in your image. From my back yard, I don't ever see it. Just knowing that eventually the Andromeda Galaxy will eventually collide with the Milky Way makes it always seem ominous to me. Well done! I also have a 8" LX90 and I am interested to do some AP, so please give me more information : Did you use a polar wedge? did you do PEC training ? RAW or jpeg ? with what software did you do the stacking? Why did you use a focal reducer ? Thanks Piet. I use the Meade wedge for the 8" model and polar align. I have replaced the finder scope with an illuminated polar scope from Orion. I have not tried PEC training yet. I always shoot in RAW and JPEG and stack the RAW images. I use Deep Sky Stacker to stack and Canon Digital Photo Pro, Photoshop and Iris to process the stacked images. The focal reducer gives a wider field of view and flattens the image somewhat. It also helps reduce the exposure time. One of the best investments I've made is the Backyard EOS program to control the DSLR camera. It has allowed me to set the camera for various exposures, ISO's and timing. It also has a focusing aid that has greatly improved the focus. When I took this shot, my intent was to do a mosaic of M31. I divided it up over 3 shots and this was the middle one. I had never done a mosaic like this before so it was a learning curve. What I learned was the overlap needs to be at least 40% for each shot if your using PhotoShop to process which I did not know and did not allow. I was able to put them together with a photo stitch program from Canon but it really didn't turn out very well. I have attached it so don't laugh too much! I have the Meade wedge and a Nikon D5300 but I have a lot to learn especially about the processing side. I have a LX90ACF and with that you cannot use the Meade focal reducer because it already has a flat field. With my setup I can nearly fit the moon in a frame so I would have thought M32 would fit in one frame.